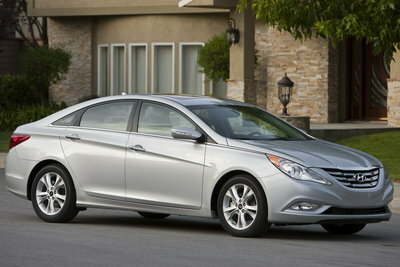 The Hyundai Sonata has become an increasingly popular mid-sized sedan. Quality awards and long warranties have added to the traditionally strong price value that Hyundai offered. Like the Accord and Camry, Hyundai manufacturers the Sonata in America. This roomy FWD sedan is powered by four-cylinder engine mated to a six speed automatic. While other vehicles in the segment offer six-cylinder engines, the Sonata's four cylinder is more powerful than those found in other models while posting an impressive fuel economy rating of 23/35 (city/hwy). The Sonata is offered in three grades: GLS, SE and Limited each with a healthy list of standard equipment. If performance is the goal, the Sonata is available with an optional 2.0l turbocharged four-cylinder engine rated at 274-bhp. Introduced in 2011, the Sonata hybrid model pairs a 2.4l four-cylinder engine with an electric motor to achieve a fuel economy ratings of 34/39 ( city / highway ).